In April 2018 was held the largest Pay-Per-Click conference in North America: Hero Conf Austin 2018. Every year, Hero Conf brings together more than 600 PPC experts from both the agency and customer sides, as well as from the supplier side. As a search digital media practice lead at Adviso, I had the opportunity to attend the event! Here are the 3 trends that you should definitely keep in mind for 2018-2019. We can’t hide the fact that online marketing is becoming more and more competitive and the only way to make it through the game is to have a message that stands out. At Hero Conf, many of the workshops I attended were about the art of sending the right message to the right person at the right time. This crucial question will allow you to strengthen your strategy, keeping you a step ahead of your competitors! In hindsight, our job as a marketer is not witchcraft: all we have to do is tell the right story to the right people so they can discover a product or a service. That’s it! The best way to make it happen is by knowing your audience. Whether in SEM, display, social, content, email, it is essential to adapt each of your communications to your targets and the purchase phase they’re in. Take, for example, an online eyeglass business. The message addressed to the age group 18-25 should not be the same as the one for the age group 45-65. Not considering audience demographics can have a big impact on your brand’s online performance. Here’s an example of communication axis for these 2 groups. Here are the elements to consider when creating your story. Once your story is set, add some emotion so that your message resonates with your target audience. Then, just let the magic happen! Every personality type can be reached differently. Again, it’s only a question of how we tell our story to reach the right target audience. 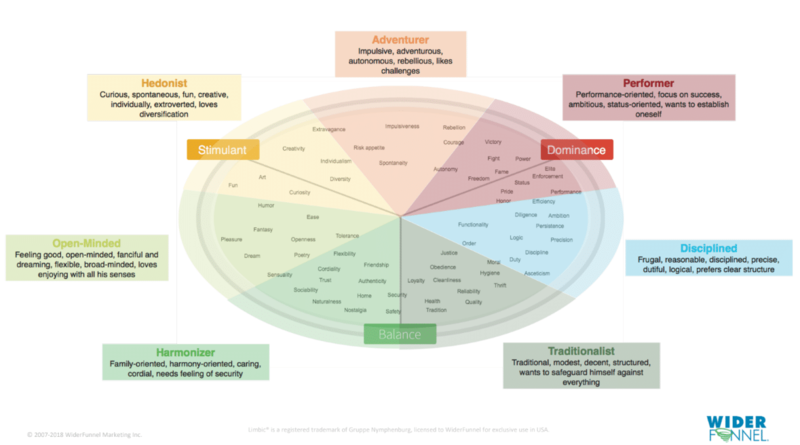 Here’s a chart that will help you determine the right approach for each personality type. 55% of users start their product quests on Amazon? the conversion rate on Amazon is 2,200% higher than the average of the 500 largest websites? the conversion rate of a Prime member is 74%, versus 13% for those who are not? 70% of Amazon users will never go to the 2nd search results page? 35% of Amazon users click on the 1st product of the search result page? the first 3 products shown on a result page get 35% of clicks? Amazon Marketing Service (AMS) is a self-service platform offering 3 types of ad placement: 2 Display and 1 Search. The AMS solution can serve many marketing needs, from brand awareness to pure performance. 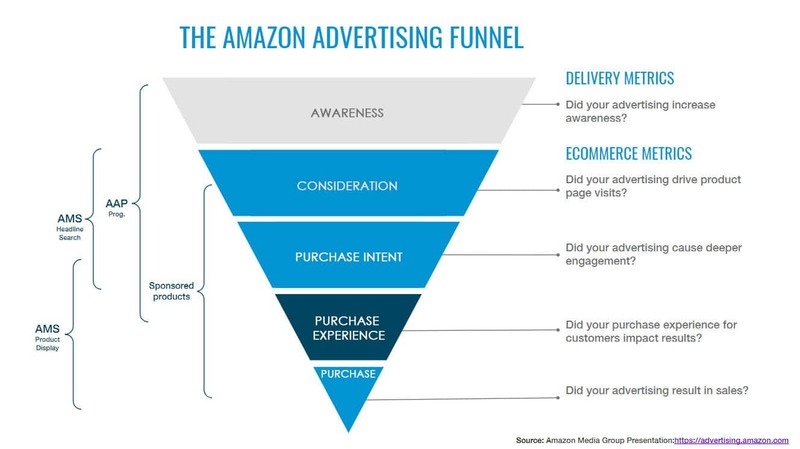 Amazon is essential to any brand that sells online. Amazon formats are very similar to some Google products, such as Google Display Network, Google Search Ads and Google Shopping Campaigns. Each of these products has a different role throughout the purchase process. A company that sells its products online and in physical stores often finds itself torn between two completely different campaign objectives: online sales and in-store sales. From a business perspective, it’s capital to break the silos and that online marketing initiatives keep track of sales and other store performance indicators. Since 2016, Google has enabled AdWords advertisers to access a new metric that allows them to connect web initiatives and return-to-stores: Stores Visits Conversions. Google is now able to know if you have physically visited a store after being exposed to an online ad, thanks to its algorithm that takes into account your GPS data, your wifi connection, your Bluetooth connection, etc. With this new metric, we can now quantify users who have visited stores. On average, there are 3 times more in-store visits than online sales, which gives us very interesting information on campaign performance. Moreover, this new tool allows us to measure the return on investment much more accurately, in addition to sharing key insights with our clients to optimize their online and offline marketing budgets. This year again, the Hero Conf in Austin covered a multitude of topics related to the PPC. For 2018-2019, keep an eye on the personalization of your messages, the introduction of AMS in your strategy, the reconciliation of your online marketing initiatives with your offline results and you will be one step ahead of your competition. Do you agree with these trends? Did you have something else in mind? Share your thoughts below! Nicolas quickly climbed the ranks at Adviso and is now Digital Media Practice Lead. With this role, he leads the training of digital media specialists and ensures that the best SEM practices are maintained in all projects. Having previously worked in IT, Nicolas understands algorithms and how to put in place the best SEM strategies.